Who would have thought our salvation may be in the hands of a paintball gun. I’m not referring to the “afterlife”, rather an interesting theory to protect earth from the thousands of asteroids willing to put an end to life as we know it. Hollywood had me sold on the notion that nothing less than a self sacrificing suicide mission, aimed at the heart of any space menace would protect humanity. The funny thing is, I don’t think a Hollywood writer could have come up with cosmic paintball. Sung Wook Paek is a recent graduate of MIT’s Dept. of Aeronautics and Astronautics. He was awarded the 2012 Move an Asteroid Technical Paper Competition by the United Nations Space Generation Advisory Council. In a nutshell Paek’s theory is pellets of paint powder fired at an asteroid from close range, in two rounds – one to cover the front, the other the back of the asteroid, would initially bump it off course a little due to the force of impact. After that the paint would double the reflectivity of the sun’s protons and nature would take its course, steering the asteroid away from a doomsday collision with our planet. A few problems with Paek’s theory – he predicts it would take tons of paint and at least 20 years for the asteroid to safely pass us by. That said, I like the idea of cosmic paintball a lot more than nuclear fire crackers complete with their unpredictable behaviour. A few days ago sunspot AR1618 started to act up. Now ten times wider than Earth, bubbling with plasma and deciding how big a deal it’s going to make of it – NOAA predicts a 70% chance of M class flares, and 15 of X in the next 24 hours. Any eruption in the next 24 hours will be earth directed. Solar wind is blowing at a good clip of over 400 Km/sec. At the very least this combination should bring some spectacular auroras. My solar pondering is not without reason. The ” Carrington event” of 1859 and “Bastille Day event” in 2000 are evidence of why I keep my eye to the sky. 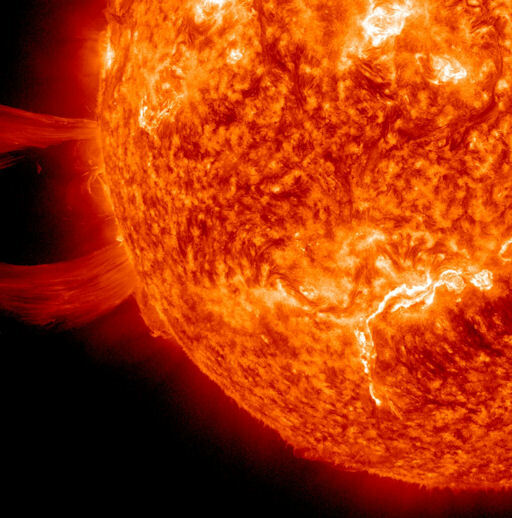 If a solar flare equal to the Carrington flare hit earth today our power grid would certainly fail. Ponder life without power for days, weeks, or even months. The Great Plains stretch from Texas to Canada. In a time before settlement, home to massive herds of buffalo who fed on the thick layer of protective grass. Prone to periods of drought, it was the grass, with root systems reaching up to five feet deep that trapped moisture and maintained a perfect balance. In the late 18th and early 19th century the plains enjoyed a period of relief from draught. Believing the rain would continue to fall settlers arrived by the thousands. Land was plentiful. The Homestead Act was revised in 1909 offering 320 acres of free federal land to “homesteaders” willing to try their hand at dryland farming. Up from 160 acres in the original Homestead Act of 1862, and considering the pattern of plentiful rain, it seemed to good to be true. So began “the great plow”- mile after mile of grassland turned gold, wheat blanketed the land. Throughout the 1920s rain fell, farmers prospered with wheat prices at $2.00 a bushel – possibilities seemed endless. When the stock market crashed in 1929 wheat prices began to slide. Farmers responded by plowing more land, they reasoned that more wheat even at lower prices would maintain their families until conditions improved. They never considered the rain would stop – the plains fell under a catastrophic drought that would last for the next ten years. The terms “dust bowl” and “dirty thirties” can’t begin to describe the misery. With the protective grass plowed under barren fields, nothing prevented the top soil from turning to dust in the wind. Imagine day after day, year after year, never being able to go outside without a face mask. Livestock died, their noses, mouths, and lungs caked in mud. Starving rabbits and hungry insects devouring any attempt to grow vegetables. A home where you couldn’t open your windows. Ponder the sun disappearing in the middle of the day behind a curtain of dust, at times hundreds of miles wide. Then your children fall sick, victims of dust related pneumonia. Hundreds died, thousands left, many more endured. 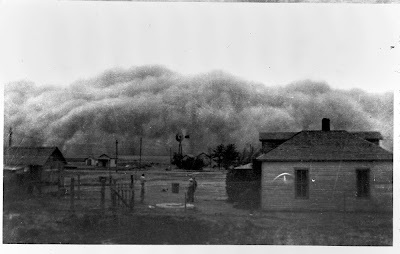 The “dust bowl” is a cautionary tale of what can happen if we ignore the balance of nature. We seem to forget that we can’t control the environment. All the technological advances in the world can’t stop a force of nature. Time to ponder the consequences of our actions. 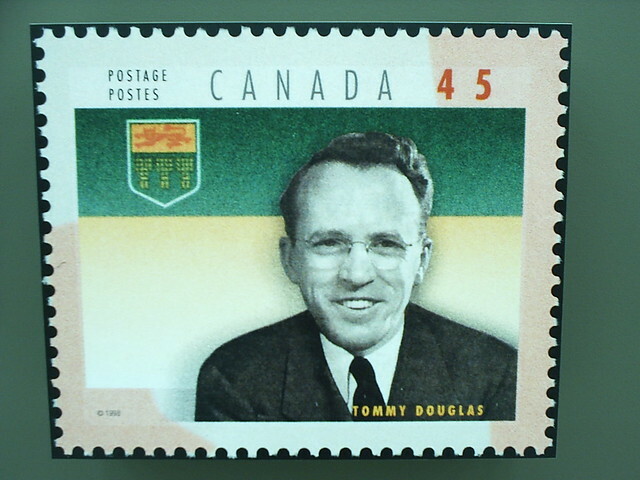 So much of what Canada has become is owed to Tommy Douglas. Born in Scotland in 1904, Tommy’s family immigrated to Canada when he was 14. They settled in Winnipeg; it was 1919 the year of the Winnipeg general strike. Tommy left school and became a printer’s apprentice. In 1924 he decided to become a Baptist Minister. He believed in a Social Gospel – the belief that Christianity had an obligation to care for people in life, and not simply focus on the afterlife. Douglas found his political bone when he moved to Weyburn, Saskatchewan in 1930. A dust bowl, hard hit by the depression; his socialist views took shape. He started a local independent labour party, a few years later attending the first national convention of the Co-Operative Commonwealth Federation (CCF). In 1934 he ran for provincial office in Saskatchewan and was defeated. In 1935 he tried again as a CCF candidate in the federal election, winning a seat in parliament. Re-elected for a second term, in 1944 he resigned returning to provincial politics in Saskatchewan. As Premier of the province for the next 17 years, Douglas laid the ground work for Medicare, pension, and social service programs that are now standard in Canada. In 1961 Douglas quit provincial politics to run federally as leader of the New Democratic Party. A fusion of the CCF and Labour parties. He was defeated in the 1962 election. Many credit his defeat to the backlash caused by Sask. doctors striking after he introduced Medicare to the province. A 1971 by-election gave Douglas a federal seat in parliament until he retired in 1979. Douglas was awarded Companion of the Order of Canada in 1980. He passed away in 1986. Whatever political view you might take, Tommy Douglas is the man responsible for the social programs at the heart of Canada ( He also happens to be Keifer Sutherlands grandfather ). His Social Gospel would go a long way these days. Something a lot more people should be pondering. If news of an impending global disaster should break consider hopping on a plane to Albania. 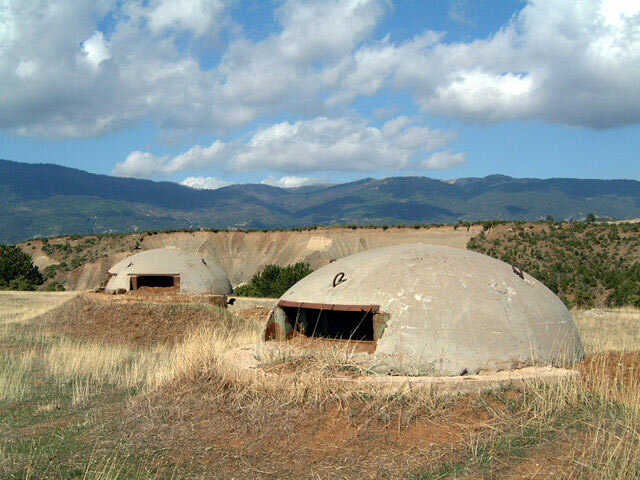 Between 1950 – 1985 Albania built over 600,000 bunkers, enough to house the entire population. Albania has more bunkers than any place else in the world. No guarantee you would be welcome, and doubtful an Albanian bunker would offer any comforts of home. Perhaps just something to keep in mind if you happen to be in the area. For those seeking a bunker closer to home the options are astounding. Forget the cold war era cellar, and consider the marketing plan from Vivos. This California company will take your money in exchange for a place to go when it hits the fan. Bunker “kits” are available on-line, ebay offers cold war era fallout shelters, and “doomsday” real estate is big business. You can purchase old missile silos ready to accept modern conveniences or if money is no object multi million dollar fortresses. All I’m pondering at the moment is the sorry state of my emergency kit. As a child of the cold war years paranoia is understood. As a practical middle aged woman, I’m making sure I have a few days supply of food and water. Unless companies like Vivos have secret technology to transport clients to their facilities when calamity strikes, I’ll take my chances at home. I haven’t done a space report for a while. Today we dodged a big one. A massive eruption on the far side of the sun could have had some interesting consequences had it been directed at earth. The solar wind is steady at 396 Km/sec. A mind boggling speed when you stop to think about it, yet just an average day on the sun. Of the current 1353 Potentially Hazardous Asteroids (PHA) – any object 100 Lunar Distance (LD) or less from earth, (LD is the distance from earth to the moon), the closest one for the remainder of 2012 passes by tomorrow. Named 2012VS76 it will come within 2.4 LD and measures 18m across. The largest is 4179 Toutatis, on Dec. 12 it will pass 18 LD. for which we can all be thankful as Toutatis is nearly 3 Km. wide. 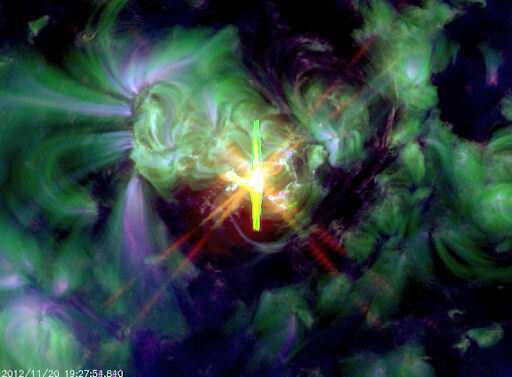 Sunspots AR1610 and 1614 are getting restless, NASA predicts only a 25% chance of an M class eruption and 5% for an X. There has been some impressive geomagnetic activity lately. Geomagnetic storms occur in the upper atmosphere when magnetic energy from the sun, propelled by solar wind or energy from coronal holes messes with our magnetosphere. 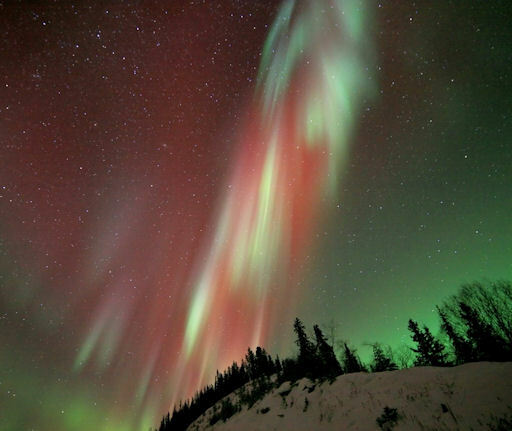 A recent magnetic storm resulted in rare red auroras. We can expect spectacular auroras for the next few days. I was happily pondering an opportunistic species of frog; able to mate at will with either gender when the mayonnaise line clouded my thoughts. I hadn’t given it consideration in ages. The frog can wait; the miracle whip line deserves a little scrutiny. Hardly any of us butter the bread on our sandwich. Mayonnaise is the new butter. Slightly tart, perhaps a hint of lemon or garlic if you’re feeling adventurous. It holds things together, moistens the bread, and compliments anything you choose to pile on top. 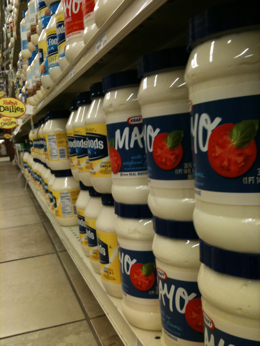 Then there’s Miracle Whip or the generic Salad Dressing. The only thing these condiments have in common is their colour. Miracle Whip is slightly sweet, thinner and a lot less expensive. Generalizations are fraught with peril, with that in mind I proceed with caution. Studies seem to indicate that Americans living in the south prefer Miracle Whip and Pepsi; the north mayonnaise and Coke. To my surprise Kraft claims to sell more Miracle Whip in Canada than the U.S. This cholesterol debate is irrelevant, it was another light bulb that went off. Wouldn’t it be great if we all stopped buying either. Think about the tizzy it would create. Forget occupy protests and concentrate on sandwich spread. Whip the marketing geniuses into a frenzy. It’s so easy to make your own mayo, season it any way you like.